Premium Pet Sitters - Professional non-smoking couple for 2 years. Animal loving. Early 30's/late 20's. No dependants. Willing to travel. Runs own online business. We run our own companies online and one of us can be home at all times if required. As you can see from other recommendations, in addition to caring for your pets, we leave your home clean and tidy as we found it. We ensure you will come home to things like milk, eggs, bread and a home cooked meal so you don't need to rush to the supermarket on your return. This is reflected in our reviews from other home owners. Nick and Amy took care of our Golden Retriever Ted while we were away visiting family in America. Ted is quite old and we were very happy they attended to his needs, were patient on his walks and were diligent with his medical requirements. - Dan & Cathy, Adelaide. Hello, we're Nick and Amy, and for the past 2 years we've been providing security and peace of mind for a number of home and pet owners across Australia. We're location independent, have engineering backgrounds and own our online businesses which leaves us flexible and able to travel to watch over your beloved animals and cherished possessions. We're in our early 30's/late 20s, both non-smokers, have no dependents, and no pets. As avid travellers, internet entrepreneurs, health conscious individuals, photographers and videographers we love that house sitting enables us to see new parts of the world and we get to see why you love living at these locations too. As animal lovers one thing we regularly miss whilst travelling is the companionship they bring. We miss walks, playing, and cuddling on the sofa; but most of all we love providing them with the attention that you would give if you were there. We know you must be missing your pets so we send our clients pet photos on a regular basis to update you. Most of all we love to house sit because we want to make sure that whilst you're away, not only are your pets in an environment that they're used to (rather than a sadder time in a kennel) you're also able to relax in the knowledge that we'll care for your home as if it were our own. Prior to house sitting, we both have Engineering backgrounds and have worked within events management and hospitality while studying. Amy has a food business so has carried that level of cleanliness into how we look after our own home, and the homes we watch during sitting assignments. She also manages the families short-term accommodation business in Victoria so understands the level of respect and cleanliness needed to ensure property is kept to a high standard. Nick has managed companies and large teams for over 7 years so is very organised. We've both lived away from home for more than ten years and have been responsible self-supporting adults ever since, for which we have character, work, and landlord references. grew up on a farm so very comfortable caring for many different animals including chickens, dogs, cats, birds, lizards, turtles, fish and guinea pigs. Amy seems to have a special affinity with animals and they feel at happy with her virtually straight away. One of the pets Ted we looked after was very old and on a strict medication regime which we looked after him well to the delight of his owners. We can leave you with a copy of our passport and driver's license, as well as police clearances if required. - Live-in house sitting by mature, trustworthy, non-smoking, professional couple. - Avoid kennel costs! Pet minding, including walking cleaning, giving medicines, and generally giving them good company and a fun experience. - Garden maintenance & continuance of any other maintenance services. - Keep in touch if reassurance is required, we can even Skype. - We would also update you with photo's via email so you can see first hand that your loved ones are being cared for with such love and attention, which will also put you at ease. - Experience in looking after properties with unique pets that can not be put in a kennel situation, chickens, rabbits, reptiles etc. - Confidence that your home and possessions will be looked after with attention and respect. 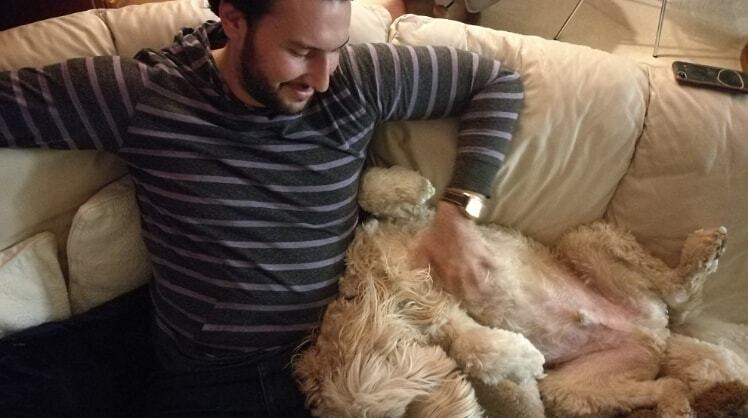 "Nick and Amy took care of our Golden Retriever Ted while we were away visiting family in America. Ted is quite old and we were very happy they attended to his needs, were patient on his walks and were diligent with his medical requirements." Nick and Amy did a wonderful job caring for our dogs and also house-sitting for us. They spent time with our old dogs and found them very affectionate. They sent us some lovely pictures and had some printed out with frames for us when we returned. They kept in touch with us and responded very promptly to our messages. We recommend them very highly.